There’s a new Hair Lounge in town. 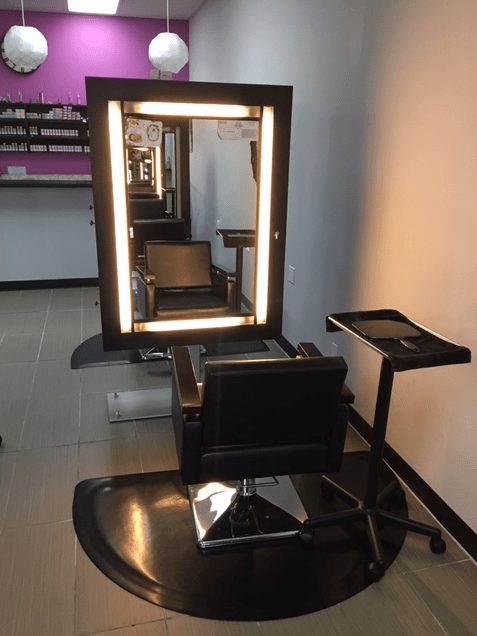 High-end, yet accessible, and approachable, “It’s all about the talent here,” said Russ Fromm, who recently purchased the cutting edge salon along with his wife Roberta Angelica. Fromm and Angelica are a dynamic duo, who, along with a talented staff, have taken the centrally located Escondido Promenade salon to a whole new level. As Escondido’s premier Aveda and Olaplex salon, also featuring Unite and Redken products, and many more. Also, an Esthetician’s Room, with top of the line products and equipment, and a Photo Station, are in the works. They combine style with customer care in a first class manner, according to clients. Specializing in creative, stylish and affordable haircuts for women, men and children, the salon provides professional service while earning a reputation for best creative color work and extensions, in greater Escondido. (L-to-R) Christina Reinig, Shera Sandwell, Alex Zamarron. Finding truly talented stylists is such a big deal that Fromm and Angelica looked high and low for just the right fit when it came to locating a salon business around Southern California. A drummer, real estate developer, entrepreneur and retired Professional Registered Trader on the Toronto Stock Exchange, Fromm owned and operated salons in Canada, so he knew what he wanted in a salon. Angelica started working in the salon business, as early as 14. Her first experience was at “Sweeny Todds”, owned by David Lake, where she discovered the transformative magic of color and a great pair of scissors. Also an actress and model since age 7. Born in Malta and raised in Toronto, with numerous TV and movie roles including principle roles in “ Boondock Saints” and “Nikita”, and leads in David Mamet’s “Lakeboat” directed by Joe Mantegna, and “Absolon”, with Ron Pearlman, and Lou Diamond Phillips, just to name a few. An entrepreneur in her own right, she joined forces with Fromm 10 years ago, and the rest is history. After deciding to relocate to Southern California, the couple went looking for a great place to call their own, professionally and in terms of lifestyle. Naturally, they came to North County, and after a thorough search, found their calling at Escondido Promenade, just off Interstate 15 and Valley Parkway. “We did our due diligence,” Angelica said. “We knew when we walked in and the first person we saw was Christina Reinig. I loved the vibe. As soon as we left, we said this was the place. I work off of energy and my instincts, if you listen to them, it tells you more than anything else. They felt it had great bones & like transforming places by throwing some sparkle on it. It just needed a little TLC. The proof was in the pudding and in this case in the scissors and styling. “Alex (Zamarron) and Christina have gifts that can’t be taught in this industry,” Angelica said. “It’s having an excellent sense of color and tone, being a bit of a scientist. Dramatic transformation comes from being a master of fundamentals. Zamarron is a master stylists, colorist and, oh by the way, salon manager. 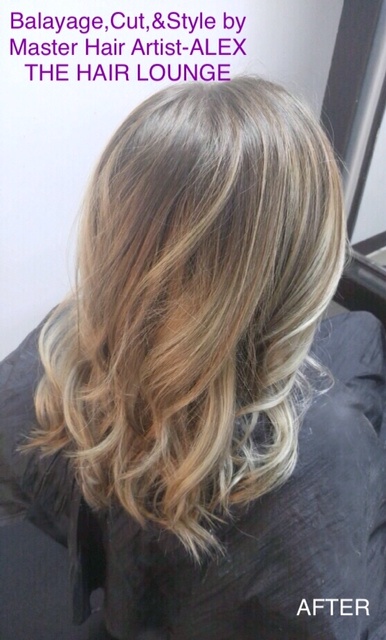 Reinig is master stylist, colorist and assistant salon manager. They work with some of the top professionals in Southern California, who felt the vibe and gravitated to a place of professional pride. Angelica Alvarado, Hans Harrebomee Jr., and Shirley Ramirez, also all Master Stylists & Colorists each with a dramatic talented flare of their own and are an integral part of the team. 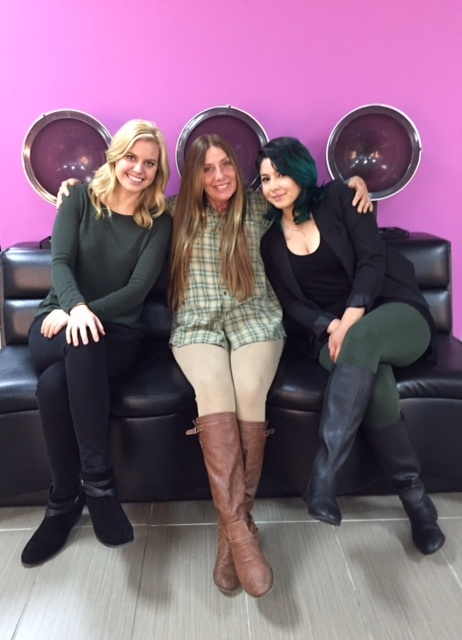 They all work together to create the harmony at The Hair Lounge! Jessica Hernandez is a junior stylist, colorist and make-up expert and a fantastic addition to the current staff. Jacob Jones, a cosmetology student, handles reception and is looking forward to becoming a stylist this coming summer. Austin Penner completes the team as the Mobile Advertiser and works hard to attract new clients. The Hair Lounge uses natural products that work. Coming in for a consultation sets the stage for cutting edge looks or yesterday’s classic coiffure. Stylists work with clients to identify what suits them best. Master Stylists use Aveda, Redken, Olaplex, Wella, Unite, Pravana, AG and more of the top line products, to create beautiful hair. Extensions are a whole new world. 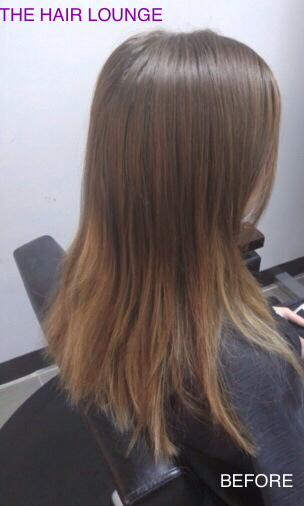 Stylists use their best judgment and skill installing and determining extensions for the best full, long look. Updos and wedding style packages also are popular. Developed by two of the world’s leading materials and chemistry PHDs, Eric Pressley and Craig Hawker, this single-ingredient chemistry product is devoid of silicone or oils. It links broken bonds in the hair during and after chemical services making them stronger than they were before. Aveda is another cutting edge product used by The Hair Lounge professionals. Holistic beauty pioneer Horst Rechelbacher created this environmentally-friendly hair care, skin care, cosmetics and body care brand. Naturally derived, botanically-based products combined with high performance commitment to excellence. Everything is state of the art at the Hair Lounge. 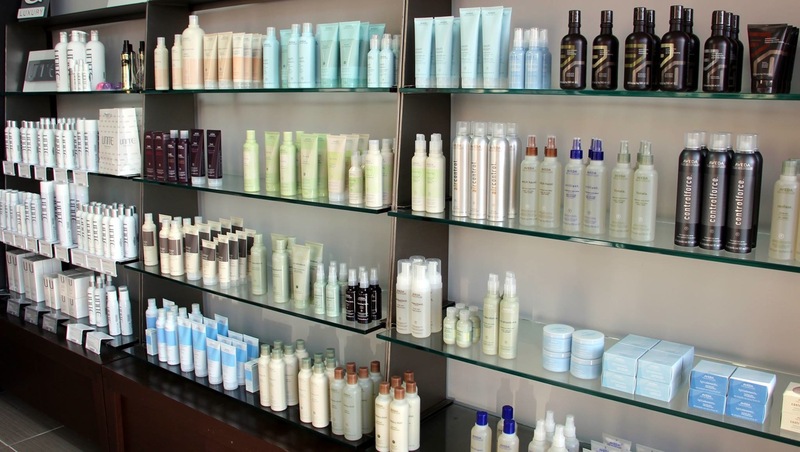 The Hair Lounge also uses Unite Hair Products, founded by acclaimed hairdresser Andrew Dale. Locally based at Vista CA, Unite is growing rapidly due to high quality hair applications, healing and reconstruction products. Unite is featured by prominent designers and some of the most high-profile salons in the world. And it’s locally made. Redken 5th Avenue is an international brand where beauty is powered by science. Patented protein developed by entrepreneurial American actress Paula Kent and her hairdresser Jheri Redding — “Redken,” get it — through Redken Laboratories, founded in 1960 pioneered the concept of protein reconditioning products. All that, a 15 percent discount on all hair products for new clients, and more, awaits guests of The Hair Lounge. It’s at 1210A Auto Parkway. 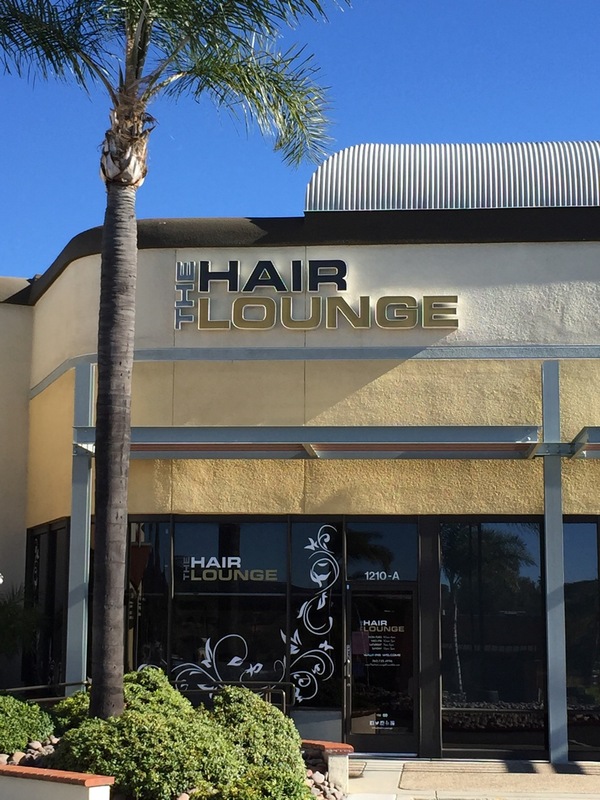 Call (760) 735-4996 for appointments and visit virtually online at www.thehairloungeescondido.com and https://www.facebook.com/TheHairLLounge. The Hair Lounge, 1210A Auto Parkway, Escondido. Be the first to comment on "The Hair Lounge is where style meets grace"